The 1932 comedy Gli uomini che mascalzoni (What scoundrels men are!) with a very young Vittorio De Sica open with a long tram chase. A scene from What scoundrels men are! If you never happened to see it, linked here you can find a few selected scenes from What scoundrels men are! (which is currently in the Public Domain). It’s a light comedy as befitted Italy in an age when Fascism had already been in power for a few years, but it is also packed with vintage images of Milan. Check out these images here or clicking on the photo. 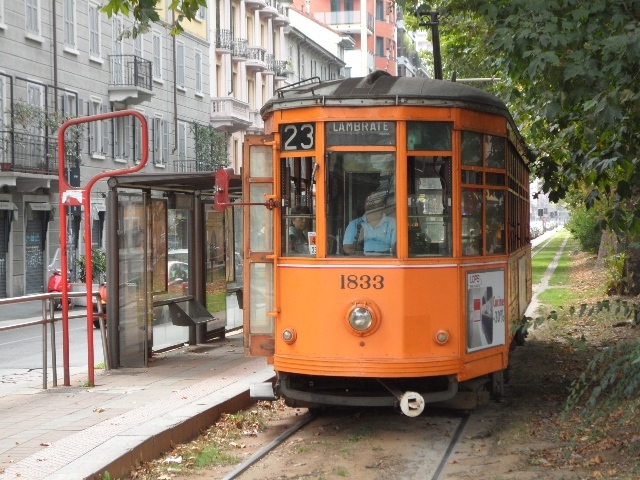 Tram car n. 1833 in 2011 (photo by Pertegheta). The tram car in the sequence, a classic Carrelli 1928 car, is still running. Originally painted green, it is now orange-colored and serves on the line 23, circling the center.